Yikes is it almost Halloween already? For many decades the U.S have been embracing the demons and ghouls of holiday retail and it seems the U.K has awoken and is about to join the Americans in the thrills of Halloween. Now, the U.S has long been the bastion of the night of thrills and spills, the 31st of October in the U.K has been the least popular of the holidays for shoppers. It seems as the daylight begins fading earlier and as the leaves change to auburn, orange and red, the winds of change have hit shoppers and retailers. Now, I’m sure Halloween has been an important date for many of you but for many years it has been regarded as a phantom holiday in Britain, finally however there is a trend in recent years that has been a positive one for retailers. New research from Mintel estimates that Brits will spend £310 million on Halloween in 2016, terrifically up 5% from £295 million in 2015. This number is not in the same cauldron as the gigantic amount Americans spend but it is the trend of increase of spend is becoming consistent. An NRF survey found that American shoppers will spend a hair-raising $3.1 billion on masks, and other apparel. Another $2.5 billion will be spent on the treats that will fill trick or treaters’ bags. And shoppers will fork out $390 million for cards wishing friends and family a happy Halloween. Those figures alone must have given you goose bumps but it does make sense when you look at the increase in spending per shopper. In 2015 individual shoppers spent $74.34 last Halloween, this is contrast to the $82.93 that will be spent this year per shopper. What demonic demographic is spending their cash? It appears that American and British Millennials are the pumpkin to your pumpkin spiced latte when it comes to the eeriest night of the year. Last year, as many as half (50%) of Millennials spent money on Halloween. Surely it’s not just the young folk enjoying Halloween? Generally, Mintel found that around a third (32%) of Halloween purchasers spent more on Halloween products in 2015 than the previous year, increasing to almost half (48%) of Millennials. In 2015 Halloween became the UK’s second-biggest party night after New Year’s Eve, according to analysts at Conlumino, the thrills and spills of Halloween is becoming an integral part of the yearly rituals of a Brit, finally following in the footsteps of the Americans. 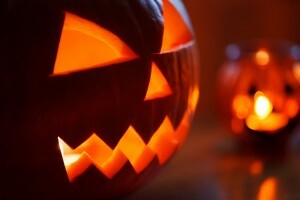 So when you’re attending your Halloween parties with an eclectic mix of astronauts, devils, nurses and zombies, I hope you briefly hesitate, just before you start bobbing for apples and consider the vast importance Halloween has for retailers has and will have in the coming years for the U.K and as always the U.S. So with all of this frightening activity, do not hesitate to contact Island Pacific to get the systems capable of dealing with the ghouls of Halloween retail.